Why should we pay extra for the DHP when we already pay for police protection via our property taxes? We can provide multiple reasons. The Atlanta and DeKalb Police Departments are overextended and understaffed and basically deliver 911 emergency response, not regular crime-deterrence patrols. View the DHP-area APD beat map and the DKPD beat map to locate your home and view the geographical area that the single beat officer protects. (Note: Some APD links are still not functioning properly due to the March 2018 cyberattack.) Consider that for both departments, ONE officer is assigned to patrol the entire beat AND respond to 911 calls such as car accidents, burglaries, robberies, assaults, domestic violence, etc. When another emergency occurs while the beat officer is already handling a call, additional police units are available to respond. Of course, DKPD and APD prioritize calls to ensure that serious emergencies such as armed robberies, assaults, home intrusions, vehicle accidents with injuries and the like always receive rapid reaction. However, those extra officers are floaters who may have to be pulled from another call or travel across the multi-beat precinct or even travel from another precinct, and that can cause delays in response time. Crime is worse in other beats and precincts, and demand for police services pulls officers into those areas. Clearly, these circumstances mean that we cannot expect our understaffed police departments to rapidly respond to a call about a suspicious person wandering the neighborhood, a strange vehicle parked in front of our house, etc., but we CAN expect a rapid response from the Druid Hills Patrol during the hours they provide the much-needed patrolling, because this is their purpose. The DHP officers do not have to leave our area to respond to other calls. Their ONLY assignment is to deter crime in the coverage area and monitor police radio for emergencies in Druid Hills. When they are already patrolling the neighborhood, they usually respond faster than DKPD or APD officers. A not insignificant side benefit is that they can cancel false alarms, preventing residents from paying fees and police departments from wasting staff time. 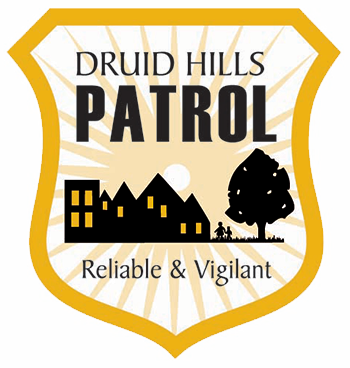 The Druid Hills Patrol offers daily, bona fide police protection. Even 8 hours per day of regular patrols is a significant improvement over the limited attention supplied by the City and County. Do this math: at such a low cost of $1.07 per day, you get a private patrol for multiple hours per day in your home neighborhood. Bona fide officers patrolling and protecting Druid Hills. Why wouldn’t you support the Patrol at that low cost?